Each kit offered by Rvinyl Tint & Auto Accessories made by Wheel Bands includes 1 coil of mounting track, 1 coil of color insert, 1 application tool, 2 surface prep wipes. High precision fit Track and Color Insert coils are 27.4 ft. (8.3 meter) in length: enough material to outfit up to four 22" wheels, or five 19" wheels or six 16" wheels. Check to be sure your wheel design has the minimum 1/4" (6 mm) flat surface required for proper mounting! Wheel Bands by RimPro-Tec fit up to 22" OEM Factory or Aftermarket Rims that have 1/4" flat lips. Wheel Bands should not be installed If your wheel design does not have an adequate smooth, flat surface required for proper mounting. Installation tool is included, online video tutorial available to help achieve professional results in 30-60 minutes. Universal fit for 12" to 22" rims. 2 year / 24,000 mile warranty. 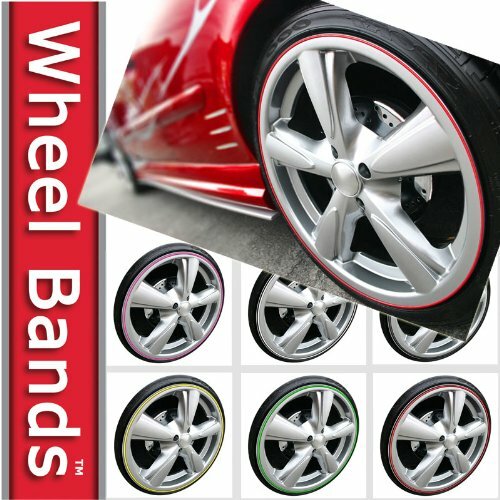 If you have any questions about this product by Wheel Bands, contact us by completing and submitting the form below. If you are looking for a specif part number, please include it with your message.